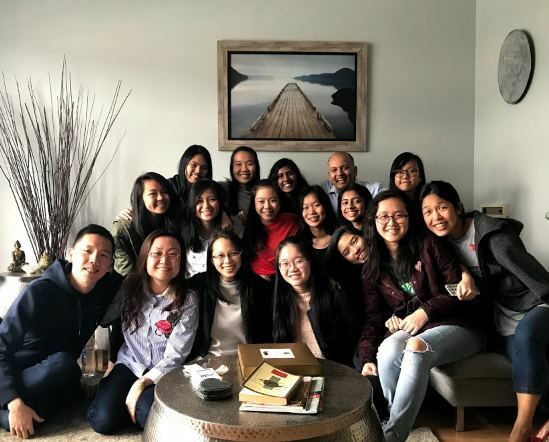 We had a phenomenal week in the bay-area, with 12 young women from Singapore and Mauritius. Alongside visiting Facebook and Google and various thought leaders, we offered them lots of other exposure. But what left an indelible mark on these young lives was the connection to ServiceSpace values. The girls kept referencing the hospitality of the Awakin Circle, or vision quest with Aryae and Wendy, or the visit with the wildlife sanctuary and so much more. And in particular, a vast majority of them mentioned how a simple morning with Nipun and Pancho had profoundly changed their life. Many of us are still confused by how loving both of you are, even to the harshest of people, and it's definitely not an easy feat. Even so, we aim to be just as warm, just as humble and just as receiving to all ... eventually. Some of them shared smiles, or hugs, or a chocolate, or a heart pin, or held a gratitude sign. The acts were small, but the transformations were huge. Most of them held very fearful narrative around strangers. When thinking of offering free hugs, they later reflected, their minds would go towards all the things that could go wrong. One of them even spoke about how she thought that someone would put a gun to her stomach! In doing these small acts of love, they released so much of that fear and opened themselves up to new narratives. You could feel their inner transformation. Desiree: I was deeply touched by the unique perspectives of Pancho and Nipun, which gave me hope for humanity. The first step of acting on this hope was through random acts of kindness. I used my newfound courage to encourage others. My group decided to walk the streets and wish people a good day. Many were shocked by our actions, and some even ignored us. We felt dejected, but those who responded positively encouraged us. I learnt that doing this was actually quite rewarding, and I should try to spread this same love in Singapore. 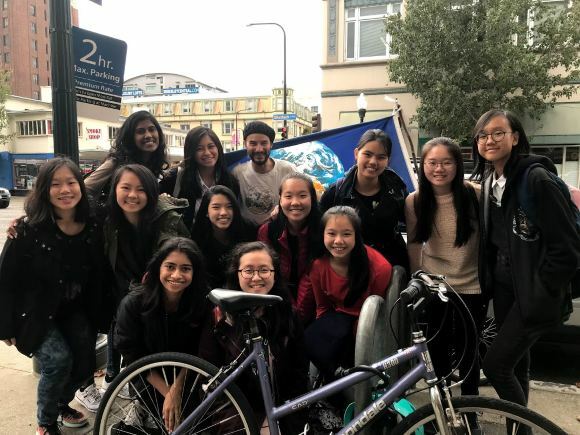 Laurene: After doing the random acts of kindness yesterday, I just have to say that this experience was something that I really, really enjoyed, and it was the first time so far on this trip that I’d felt pure happiness. We gave chocolates to strangers, gave free hugs to strangers, and the one act that really touched my heart was when we offered to help a mother who was carrying her toddler in one hand and a heavy bag of books in the other. Despite being told in the morning that there were possibilities of facing rejection, she was completely receptive, trusted us wholeheartedly and was super friendly. My heart was very full and very happy after that as we sat down for lunch. Before starting this, I totally did not expect to feel that good doing random acts of kindness but I did! Moreover, I was really impressed by Pancho’s passion for spreading love to people. He would run after a cyclist on the road despite the danger, just to offer him a chocolate, or stop and talk to a particular stranger who wanted to carry out a deep conversation right in the middle of the street, while occasionally shouting his greetings to other passers-by on the street. We later learnt that he also gave up his phD in astrobiology just to pursue this goal. His passion really came through and I just think to have that amount of love to want to spread it to strangers at no cost despite the possibilities of facing judgement or rejection was really incredible. Overall, it was an amazing feeling to be someone that can brighten up people’s day just by giving them a hug and telling them to have a nice day. Emily: We went out with Pancho to do random acts of kindness. It was really cold, my hands were freezing, but I continued to fold, because Nipun’s talk had just been so inspiring that I was left confused with unsorted out thoughts, but also #restoredfaithinhumanity. I felt compelled to use my skills, folding a simple flower and writing a simple message, to bring a smile to people’s face. I was hesitant at first, because you know, rejection and are you even allowed to stick post-its randomly in the city (we did on the lamp post and outside a cafe haha). But doing it as a group had its benefits. I felt less awkward and after one person’s validation, a simple thank you and a smile, I realised it was not as difficult as I had imagined it to be. We also gave out free hugs and one moment that felt heartwarming was when we hugged a homeless lady and she broke out into a huge smile and said “I love hugs”. It was the sense of acceptance and love that transcended during this brief interaction between a group of strangers. Knowing that you had just made someone’s day is just an invaluable gift. 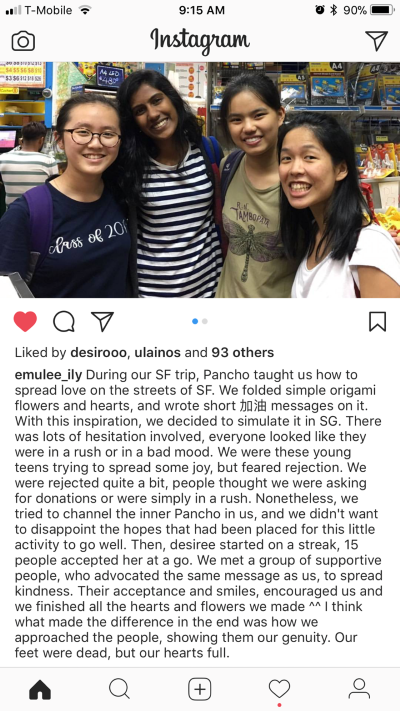 Sidnee: Dear Mr Nipun and Pancho, today, my group and I walked the chilly streets of Berkeley whilst folding origami hearts and flowers to give to random strangers. Most of them accepted the origami and notes with kind and warm hearts, and that really brightened my heart. Honestly, all encounters were special and memorable in their own ways, especially the "regular" folks who didn't do anything particularly special and accepted them politely. This made me realize that I do not need to receive such extravagant responses to feel satisfied and whole in side. As an extremely shy and nervous girl around strangers who usually avoids eye contact and bows my head in a crowd, this activity has made me more open to being open around strangers and that I should try to pass it on more often. The feeling of being smiled at and having the courage to do an activity is priceless and I feel that today, my moral capita is rich. Thank you for enlightening me! Warmest Regards, Sidnee. Shanya: Today as part of my random acts of kindness, I approached a construction worker at the junction of the road and passed him a origami heart with a message inside and I told him to have a nice day. He seemed very surprised and touched by this act which made me realize how we often take for granted what construction workers, and public service workers in general, do and how we don't take the time to thank them enough. This has really been eye-opening and I intend to develop an attitude of gratitude towards the people around me who aren't thanked enough for what they do! Shri: Hello Nipun, It's Shri, and here is my little story from today's acts of kindness: we went doing our randoms acts of kindness, everything was going well, people were do happy to see what we were doing, then we saw that homeless woman. From her accent, we could tell she was from the country. She seemed to be in so much pain, and didn't speak to people in a very polite way. And actually, it was a woman we wanted to help, by bringing her a little bit of kindness. Pancho, you know, was being Pancho. He was there, with us, not thinking twice before reaching his hand to greet a stranger. In this case it was the woman. Her reply was not exaclty what we expected. She just got angry at Pancho, saying she was healing from kind of a bullet's wound, and not to touch her. She added that she couldn't get married to her husband because he was leaving Japan and then asked for some change to buy hot coffee. Pancho told her that we were giving what we have, and that was chocolate. That's all we had after all. She didn't like that, said bye in a very rude way and asked us to find other American friends. Pancho answered very wisely I remembered, to that lady. He didn't get mad because she was being rude when we were only trying to be kind to her. He just answered kindly and then we left. No one actually said anything, and it made me remember what you said about judging without knowing the person, and his story. What made the woman react like this might have been her wounds, her situation. And we understood that. Vanessa: Today, I learnt to listen to people and learnt to hold them. As we offered a hug to a man, he told us he was a writer and proceeded to give us a spiel on consciousness and oneness with nature. Each time the conversation seemed to be ending, the man seemed to push for it to continue. After we thanked him for his insights he began to smile this big smile, which made me realize how sometimes all we need is someone to talk to. All this, in a span of just a couple hours. The power of kindness, and the inner transformation it supports, is truly amazing -- and revolutionary. Thank you, all, for giving us hope!